"For those who love the Great Lakes and seek to understand the politics of water, this book is a must-read. It depicts the threats to the lakes and tells the story of how local leaders and citizens came together to protect the waters from diversion and manage their use for the benefit of future generations." "A fast-paced, engaging, and important work of investigative journalism exploring the science, politics, and history behind the critical effort to preserve the Great Lakes. A must-read for all who cherish the home of twenty percent of Earth's fresh surface water and who are committed to its protection." "Nobody knows better than Peter Annin the stakes that are in play in the decades-old fight to protect the world's largest freshwater system from outside profiteers. And nobody tells this never-ending story better." Dan Egan, award-winning author of "The Death and Life of the Great Lakes"
"If you are one of the many people who care about the Great Lakes, you must read this book. Annin is undisputedly the preeminent journalist writing about the most significant freshwater resource on the planet." "The Great Lakes are far more than five arcs of blue on the map in the heart of North America—they are the motivating force behind 150 years of human dreams, schemes, growth, and maneuvering. Peter Annin's Great Lakes Water Wars brings to life the rapscallions, the politicians, the environmentalists, and also brings to life the five lakes themselves. Every tale is a reminder that just when the Great Lakes seem secure, someone is quietly plotting a fresh water grab." Charles Fishman, best-selling author of "The Big Thirst"
"Annin's Great Lakes Water Wars is one of those rare books that weaves together current events, policy, science and law, using the most important force of all: great storytelling. You have to force yourself to remember that you're actually reading about policy, science, and law." "The Great Lakes have been central to the lives of people in Michigan since before recorded history. We must protect the treasure that these magnificent lakes represent. In this updated edition of The Great Lakes Water Wars, Peter Annin looks at the policy challenges facing our Great Lakes, laying a critical foundation for sound management as we make the decisions today that will impact the Lakes tomorrow and beyond." "A deeply researched history of interstate and cross-border cooperation addressing the vulnerability of an essential resource. This fascinating read is a thorough analysis in policy making that will be a source of facts and wisdom when Great Lakes diversion projects reemerge." "Impressive—the first word that comes to mind after reading this thoroughly researched and eminently readable account of the Great Lakes water wars. Annin's historical narrative, based on hundreds of interviews and documents, includes tensions caused by water diversions from the Great Lakes spanning three centuries, as well as the twenty-first century's regional cooperation effort aimed at permanently protecting this precious resource." "By capturing the amazing story of our struggles to manage the Great Lakes, Peter Annin demonstrates how water challenges in this region will become more complex and unpredictable than anyone imagined. All who live near and depend on these waters will find new insights into the binational sociopolitical system we must transform to sustain our Great Lakes for future generations." "The Great Lakes Water Wars provides essential context for the region's ongoing discussions about the sustainable use of Great Lakes water resources. The book offers a thorough, informative, and insightful recounting of how the region's struggle to manage Great Lakes water resources has informed the way future uses will be reviewed and evaluated. The book is especially important now as the region works to balance its commitment to protecting water resources with the widespread acknowledgment that the 'Blue Economy' is the key to the region's future health and prosperity." "This book oozes power, from the awe-inspiring crash of waves on Lake Superior to the visceral conflict over water diversion fights, the audacity of pumping schemes, and the big idea that the Great Lakes region should have control over its own destiny. Never boring, the writing zooms along at a pleasant pace that allows the reader to absorb the issues and their quest for resolution." "This extensively revised edition of The Great Lakes Water Wars places the Great Lakes in the context of water wars across the globe. Annin's meticulous research and historical backstories mesmerize Great Lakes nerds like me and present a captivating story for general readers. It is a vitally important book by a master storyteller for anybody who relies on freshwater for life. Yes, that's all of us." "Not mere water, the Great Lakes are a spirit, ecology, economy, brand, political movement, and human right that millions will defend like family. Annin deftly draws these competing forces into his narrative of a 'century of water' that alternately points this saturated region toward vibrant renewal or a spiral of conflict. Essential for anyone who believes Great Lakes water is the next grand idea." 3. Climate Change & Water Levels—Going to Extremes? 17. Who Will Win the War? Join veteran reporter Peter Annin on the tenth anniversary of the historic Great Lakes Compact for a discussion on the unique role Minnesota has played in the Great Lakes water diversion controversy, and to celebrate the release of his second edition of The Great Lakes Water Wars, which includes new chapters on Waukesha, Foxconn, and the massive Chicago diversion. Lake Forest Open Lands presents an informative and engaging lecture series. Join us to explore with leading research scientists the Great Lakes' most influencial environmental, biological and geological developments and how they affect our daily lives. For more than a century, the Great Lakes have been the target of controversial water diversion schemes, most recently with the highly publicized and polorizing FoxxCon deal. Join Peter Annin, author of Great Lake Water Wars, the definitive work on the Great Lakes water diversion controversy for an evening discussion to explore this and other battles to protect our precious water resource. This series is offered FREE OF CHARGE thanks to funding support from the Illinois DNR's Coastal Management Program. Join Canada, UW-Milwaukee and WisPolitics.com/WisBusiness.com on Thursday April 4 for a luncheon at the University Club in Milwaukee to discuss new developments in the complicated issues affecting Lake Michigan and the Great Lakes. Out-of-basin diversions, including those affecting Foxconn, invasive species and politics all combine to challenge those seeking to manage and preserve a critical resource. Peter Annin, author of The Great Lakes Water Wars a former Newsweek journalist who currently serves as director of the Mary Griggs Burke Center for Freshwater Innovation at Northland College in Ashland. Book signing to follow event. In the much-anticipated second edition of the “terrific” (NPR’s Science Friday) book The Great Lakes Water Wars, journalist Peter Annin delivers a fast-paced narrative that brings the story up to date over the past decade. 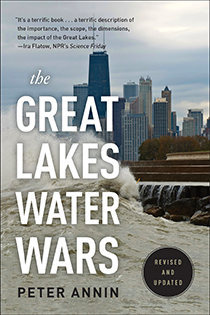 With three new chapters, four significantly revised chapters, and major updates to the entire book, the new edition of The Great Lakes Water Wars is the definitive account of the people and stories behind hard-fought battles to protect a precious resource for the millions who call it home. Annin dives into the fraught history of water use in the Great Lakes region and recaps the story of the Chicago River diversion, which reversed the flow of the river, fundamentally transforming the Great Lakes ecosystem. The new edition also addresses the new impacts of climate change on the Great Lakes. Since the first edition was published, water levels set record lows and record highs in the Great Lakes Basin and the invasive Asian carp has transformed the ecology of the river as it makes its way through the Chicago River diversion and even closer to Lake Michigan. Annin skillfully weaves the history of the Great Lakes Compact within this current context, giving new relevance to his “fascinating” (Toledo Blade) book. Check out Chapter 1: To Have and Have Not below or download the PDF here.